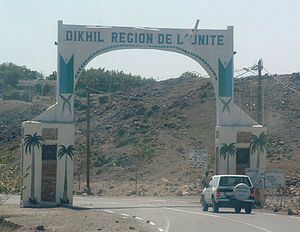 Dikhil (Arabic: دخيل‎‎) is a town in the western Dikhil Region of Djibouti. Lying east of Lake Abbe, It is situated about 100 kilometers Southwest of Djibouti City and 12 km (7 mi) north of the border with Ethiopia. The town is home to a population of around 54,000 people. The town develops gardens and fruit trees. The climate in the city is characterized by high to very high temperatures (average maximum daily temperatures by month, between 25-39 °C). Since 1986, the survey work sites were performed by R. Joussaume and researchers ISERST. The engravings oldest discovered to date are from the fourth or third millennium BC In the pre-Islamic period, the most famous is the site of Handoga Dikhil near where the ruins of a village squares subcircular dry stone delivered different objects. Including ceramic shards matching vases used brazier, or containers that can hold water, several choppers and microliths, blades, drills, trenchers basalt, rhyolite or obsidian. Also a pearl orange coralline, three glass paste, etc.. No trace of metal object. The place-name literally means "Water hole or a well" in the Afro-Asiatic Somali language. The settlement may have evolved in the latter half of the 1800s as a settlement established near a water-stop used by nomadic stock-herders on the way to the town of Zeila or Tadjoura. When Wilfred Thesiger visited Dikhil in May 1934, he was struck by "a most impregnable fort here" recently constructed by the French colonial authorities. "The walls are twenty feet high, loop-holed, and topped with broken glass and a barbed-wire entanglement. There are two large observation towers." He believed that garrison stationed there provided its only economic support, for had "the site any real value it would have been used before this by the natives. In December 1942, British invasion of French Somaliland about 1,000 British troops and Free French troops occupied the town. Following the conclusion of the 1977-1978 Ogaden War, Dikhil, along with Ali Sabieh, accommodated three quarters of the 8,000 Issas who had fled from Ethiopia. In 1979, the first President of independent Djibouti Hassan Gouled Aptidon in Dikhil the party founded the People's Rally for Progress, which has since dominated the politics of Djibouti. Dikhil is connected to other environs by National Highway 1. Public buses go from Djibouti City to Dikhil. It takes three hour to get to Dikhil. A contracted bus ride from Djibouti city to Dikhil can charge between 750 Djiboutian franc. This is a summer tourist destination for Djibouti thanks to its healthy climate and its location on the road to Lake Abbe. Dikhil is located 12 kilometers from the Ethiopian border and approximately 100 kilometers beyond Djibouti city. It is a population center for the South west area, a frontier town with about 54,000 people. As of 2012, the population of Dikhil has been estimated to be 35,000. The town inhabitants belong to various mainly Afro-Asiatic-speaking ethnic groups, but the Issa and the Afar are predominant. By the late 1960s, the population had grown to between six hundred and to one thousand people. As an inland area, Dikhil's transportation system is largely road-based. For air transportation, the city is served by the Dikhil Airport. Dikhil is one of Djibouti's main agricultural areas, with the local economy largely centered around farming. The town serves as a commercial transit point for goods between Djibouti City and Ethiopia. The city was visited by more than 6,000 tourists over the years. Ethiopian trucks and traders frequently pass through the town. Dikhil is a good location, beautiful scenery, and good air, located at an altitude of 507 meters above sea level in low-shrouded mountains and hills" and the surrounding mountains Dikhil climate is semi-desert hot during summer and cold during winter. Characterized by hot and dry summers, and mild to cool winters where most of the precipitation is concentrated (spring and autumn being pleasantly warm transitional seasons). However, due to the town's altitude and inland location, its climate features are the humidity is very low, and temperatures usually fall on 28 °C (82 °F) at night, which makes summer particularly pleasant compared to coastal cities. The rainy season extends from July to October. From November to February, the town experiences the cool winter season. It heats up from June to October, though the nights are pleasant. 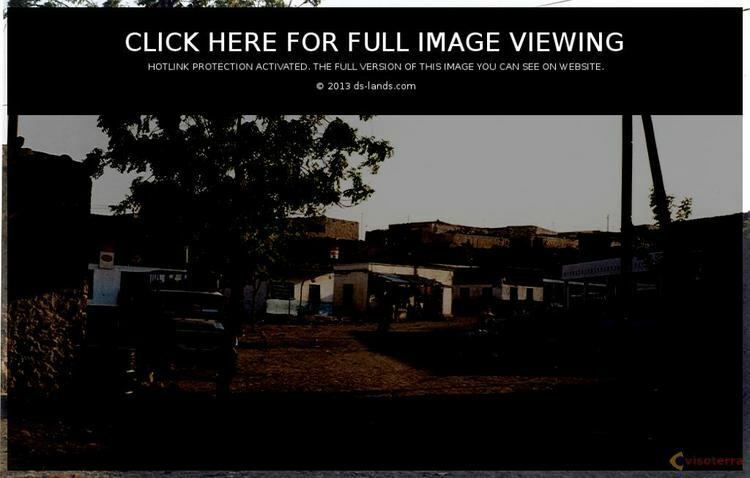 This elevation gives the settlement and the surrounding area a milder climate than the Djibouti city coastal area, where the weather is typically hot.